Raspberries and peaches originated in Asia, yet we think of them as being very much a part of summertime in America. In fact, raspberries can be traced back to prehistoric times, starting in Asia and spreading through the world by travelers and animals, and widely cultivated in Europe and North America in the 19th century. Raspberries have an almost “melt-in-your-mouth” texture…sweet with a subtly tart overtone. 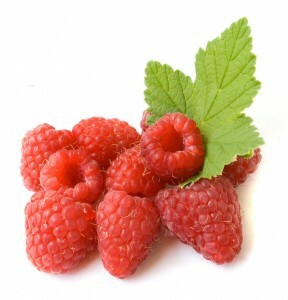 Raspberries are low in calories and high in fiber, vitamin C, and manganese. They are also a good source of antioxidants-possessing almost 50% more antioxidant activity than strawberries, three times that of kiwis and ten times that of tomatoes- which may help in the prevention of cancer and heart disease. Looking for something healthy and delicious, try this main dish recipe. Prepare grill. Brush rack with vegetable oil. Mix raspberry jam, mustard , honey, pepper and salt. Place on grill, cover and cook for 8-9 minutes per side,brushing frequently with the jam mixture, until juices run clear and center of chicken is no longer pink when thickest pieces are cut. Discard remaining jam mixture and serve chicken topped with raspberries.